After writing the post on Germany and the pork and noodle dish I cooked. It got me thinking of how many wonderful memories I have around food. I was deleting some pictures from my phone today had 1300! and it was getting a little slow, and I decided to share some of our food memories from the last two years. 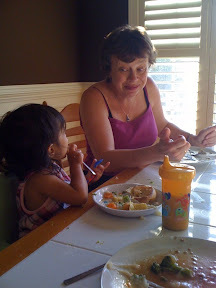 The first one is Jasmine in her high chair learning to use a cup, I remember putting a clip on Chow and Chatter when she was learning to use a spoon, things we take for granted daily. 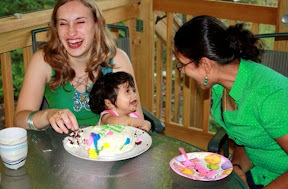 This was her eating her first birthday cake! 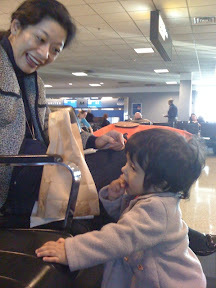 This is one of my favorite moments, we were in Washington Dulles airport after a long flight from Paris waiting for our connection and Jasmine started eating this lovely Japanese ladies fries, we still stay in touch via email now and again! 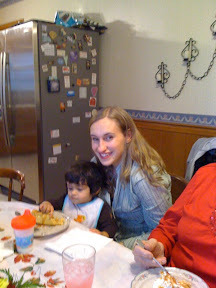 This is me and Jasmine at our adopted American families home at Thanksgiving last year, where they had a pumpkin pie cheesecake! 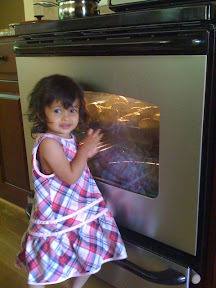 This is my little Angel checking out Mummy's Yorkshire puddings! At the Greek Festival here in Winston Salem NC, you know me always checking out great Authentic places to eat! eating noodles in China Town! 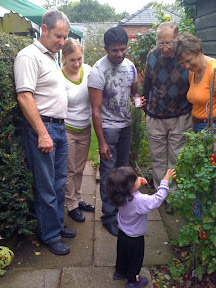 Another one of my favorite food memories, this is Jasmine picking and eating lots of Great Granddads cherry tomatoes we also picked Kidney beans for super that day! What are your favorite memories from your childhood? 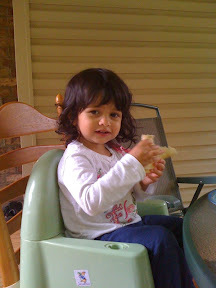 she is adorable and cute! Pictures say a thousand words, that's for sure! 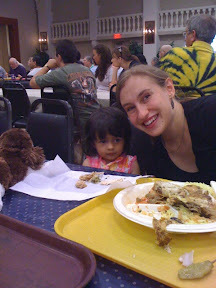 How lucky Jasmine is to have a foodie mum! You are talking to my heart; my life revolves around food and of course memories; thank you for shafing you world. That girl is going places!!!!! This post almost brought me to tears. Love it. 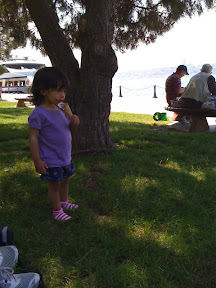 On rainy weekends we used to go to a boat restaurant to eat lunch. My parents would eat clams, crabs, etc and my siblings and I would always order the burgers - they were SO good! The joke was...whenever we went to "the boat"... the rain would stop and the sun would come out! Then we would go home and go to the beach! 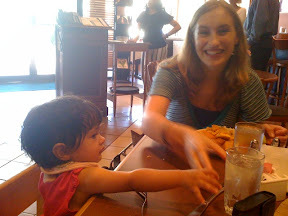 With a mother like you, she'll proabbly grow up to be a foodie too! She's so luck! 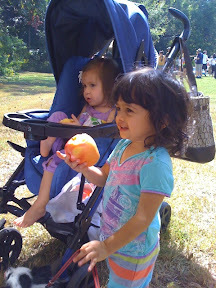 I don't know anyone who has experienced as much of variety of food at such a young age! I wish I had! what a cute little love bug! 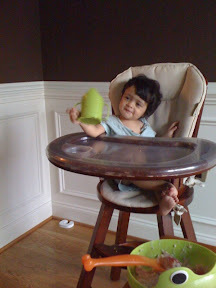 Lovely photos, I also love that photo of Jasmine eating noodles, so cute! 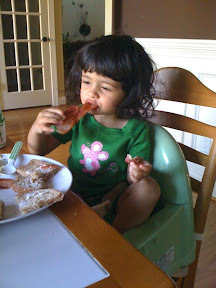 lovely photos, my own children are so well documented and food is always a reoccurring theme. Very nice meander down memory lane! When you think about it, the best memories are around food. She's too cute!! Hai fatto benissimo a condiverdele con noi, le tue foto sono belle e simpatiche. Ciao Daniela. Precious, and quite the world traveler at such a young age. Wonderful food memories, Rebecca. I'm sure your travels and food will be remembered fondly by Jasmine too. This is such a great idea! Can you imagine if we had to post each and every recipe and memory we have tried over the years? Now that would be quite a post! Love this one. Such great memories! Jasmine is growing fast, isn't she? Thanks for sharing and have a great weekend. Thank you for the beautiful post. Your J is so sweet always!!! Beautiful post. Thanks for sharing those lovely memories!Your little angel is so cute and lucky too as she have one of the best Mom always by her side. It looks like you have a lot of fun on a regular basis and what awesome memories you've made for you and your family.